Roy’s fields of proficiency and experience include retail real estate, as President and Broker-in- Charge of Farms & Estates Realty, Inc., a general brokerage firm in Waxhaw NC; land development, as President of The Sansbury Company, Inc., a large-tract, equestrian and conservancy oriented development company with successful projects in Union, Cabarrus, and Lancaster counties; and construction, as past President of Sansbury Contracting, Inc. of Charlotte, NC. His responsibilities in the above firms have educated him in numerous aspects of small business management, investor/user real property transactions, regulatory directed development, and construction management and personnel supervision. More importantly, he understands the absolute necessity for client satisfaction for any and all successful business relationships. Roy obtained a Bachelor of Science degree from North Carolina State University with graduate work at Duke University. 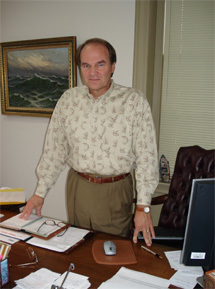 He has held his North Carolina Real Estate Broker’s license for 34 years and the same for South Carolina for 11 years. He and his wife Rosa Wall Sansbury have two sons; Bennett who is in the Coast Guard Reserve and is a Plant Manager for a Texas-based environmental reclaimation company in Greenville, SC where he lives with his wife Bracken and Labrador, Stoney; and Wilson, who is a graduate of Clemson University and currently studying in the Master of Science program co-op’ing with the BMW Corporation. Roy and Rosa live in Van Wyck, SC where Rosa manages the couple’s horse boarding and training farm. Roy is an elder in the Presbyterian Church (USA) and is a member of the Van Wyck Presbyterian Church. He sits on the Board of Assessment Appeals for Lancaster County, SC and enjoys his work as a board member for the Waxhaw Economic Development Committee. When he is not pretending to work by hiking the Carolina woods and fields with clients, he enjoys bicycling, fishing, and is an avid reader.